Funnel web spiders are a perplexing bunch. The eight-legged Australian creatures can kill with their venom, but are simultaneously required for creating the antidote. Now, it turns out their venom might have another purpose—protecting the brain from the damaging effects of a stroke. Most strokes are ischemic, meaning they result in a lack of blood and therefore oxygen to the brain, usually from a blood clot. Oxygen deprivation causes the brain to start breaking itself down, leading to permanent damage. But a team of Australian scientists have learned that a chemical in funnel web spider venom seems to block the brain’s self-desctruct process in rats. We don’t know if it will work in humans yet, but it might. Brain cells usually power themselves the way other cells do—via their mitochondria, which use oxygen to help them create lots of energy. If a blood clot cuts off the oxygen supply, the cells switch to a last-resort energy making method that’s a lot less efficient and creates an acidic environment in the brain. This over activates one of the brain’s key sensors, Acid-sensing ion channel 1a or ASIC1a, and can lead to permanent damage. Finding something to stop those sensors from freaking out in the acidic environment should prevent some of the long-term damage caused by strokes. Spider venoms from a Caribbean tarantula species, Psalmopoeus cambridgei, already seem to offer some protection—but they don’t work if they’re administered to lab rats more than two to four hours after the stroke. Funnel web spider venom seemed like a logical next step, since a few chemicals in it, including a peptide called Hi1a, looked a lot like the brain-protecting chemicals in tarantula venom. To find out if funnel web venom was as useful as they suspected, researchers induced strokes in some rats, and injected Hi1a directly into the brain. Injected up to eight hours after the stroke, it performed wonders. The rats had fewer negative cognitive effects one to three days afterwards, and a reduced amount of damaged tissue throughout their brains. The researchers published their results in the Proceedings of the National Academies of Sciences. The study’s results are obviously exciting, since the only FDA-approved ischemic stroke drugs just help the blood flow better after the stroke and don’t deal with brain damage. That’s pretty unsatisfactory, seeing as strokes are the fifth-leading cause of American deaths. But there are tons of caveats. First off, these are just rats. There’s no guarantee Hi1a will work in humans. And how long-term will the molecule’s effects be? The researchers only tested the rats’ cognitive performance after a few days. Finally, where will we get all these spiders? 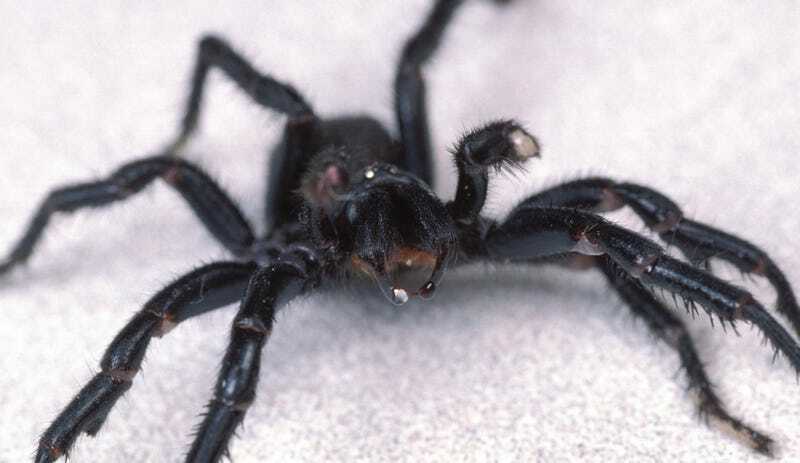 As we’ve reported recently, Australian zoos already struggle to get enough funnel web spiders to make antidote for spider bites. Would we need to weigh strokes versus bites in terms of how to deploy limited venom supplies? We’ve reached out to other researchers to get their thoughts on the study, and to ask whether the chemical could be produced without spiders in the lab. Until Hi1a is demonstrated to help human stroke victims, I’m going to keep spiders in the “scary” camp.